That’s because early Christians did not celebrate Christmas. Instead they celebrated the Feast of the Theophany, which means “revelation of God”. The Theophany had three moments: first, the revelation of Christ to the gentiles – in the person of these wise men from the east; second, the revelation of Christ as the Son of God, a person in the Trinity, at his baptism; and third, the revelation of Jesus as the Messiah at his first miracle at the Wedding of Cana. That’s why today we have the reading of the wise men. Next week we have the reading of the Baptism and the following Sunday we’ll be reading about the Wedding of Cana. Those are the three Theophanies. Which is why our Eastern Catholic brothers and sisters; the orthodox and the Ukrainians for example, celebrate Christmas today: They are not just celebrating Christmas, but they are celebrating the “Theophany” which actually begins with the first revelation, which is the Nativity. But today’s revelation, the Epiphany, teaches us something very important about our journey as Christians. These Wise Men from the east, who were not Jews, teach us something very important about finding the Truth; about finding Christ They knew that God could be found: But in order to do so, we have to go on a journey; we have to go to Bethlehem. 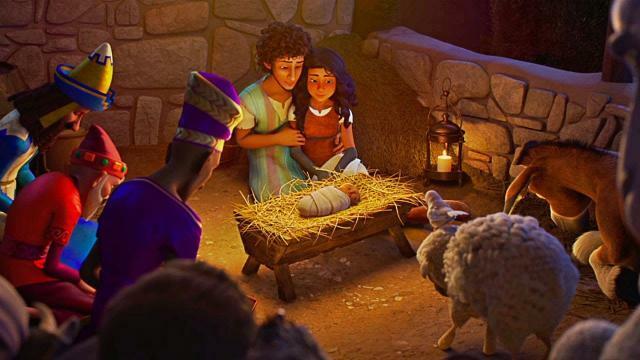 There are seven things that the wise men can teach us about how to get to Bethlehem. First: The Wise Men knew that they were searching for the newborn King of the Jews. That means that they studied sacred writings and scripture. If we want to find Truth; if we want to find God, before we get to Bethlehem, we have to study religion. We have to read spiritual authors. We have to study sacred writings. Second: The Wise Men followed a star. That means that they were not only looking for God’s revelation in sacred writings, but also in the created world. The Catholic Church teaches that God reveals himself in his Word but first, through his creation. That’s why we have beautiful Psalm 19 that says that “the heavens declare the glory of God”. Everything that God creates points to him. And if everything in creation can be studied and measured through science, then science can lead us to Truth and that points to God. If we do this, we will find that there is no contradiction between faith and reason or faith and science. If we want to get to Bethlehem, we have to follow the star – but not astrology; that’s not science; that’s superstition. But astronomy, physics, mathematics… science. Third: The Wise Men asked for directions. We have to recognize that studying scripture and looking for God in his creation can only take us so far. There are so many other people who’ve already gone on this journey and we need help; we are not on this journey alone. There are people who are further ahead on the journey that can help us. Even people who are further behind on the journey can help us. The wise men asked Herod for direction; Herod was not a very godly man. But God can use anyone to point us in the right direction. The key is to be truly searching for the Truth. I tell everyone who is serious about their Christian journey to get a spiritual director. If you want to know what that is and how it works, ask your priest or deacon. If you want to get to Bethlehem, ask for direction. Fourth: When the Wise Men arrived in Bethlehem, they entered. At some point in our journey, we have to enter. Sometimes we are comfortable continuing to search and search and we never enter; we stay outside. Even when we come to Mass, we may enter the building, but we never actually enter into the Mystery; we never enter into the celebration. If you want to meet Christ in Bethlehem, you have to enter; otherwise it’s very hard for Christ to enter into your heart. Fifth: The Wise Men prostrated themselves and paid Him homage. I think this is something we all find hard to do because worship is not something that we do day-to-day: we don’t go around worshiping things or people. So I think the idea of worshiping God makes us uncomfortable. But, we do admire people. And when we love someone, we do tell them that we love them. We praise them: we tell them that they look good. Sometimes we even say that we adore them. Do we love God enough to say that we adore Him? When we are at Mass, do we worship? Do we glorify Him when we sing the Gloria? Are we praising Him when we sing the Holy, Holy? When Father raises the Blessed Sacrament, “behold the Lamb of God….” do we praise and glorify Him? If we want to find Christ in Bethlehem, we have to adore Him. Sixth: The Wise Men gave Him gifts. Do you come expecting only to receive? What do you bring to this relationship? Your best gift may not be gold, frankincense and myrrh. Your best gift is that of the little boy who had no gift to bring so he played his drum for Him; he played his best for Him. Your best gift is yourself. If you want to find Christ in Bethlehem, you have to bring Him the gift of yourself. Seventh: The Wise Men departed by another way. When you meet Christ, you have to go back a different way. You can’t go back the same way; you can’t go back to the same ways; you have to go back a different way. Meeting Christ transforms us. If you want to meet Christ in Bethlehem, you have to be willing to change your ways; you have to be willing to go back by another way. If we truly want to find Christ, we have to be willing to go on a journey. The Wise Men didn’t just stay put; they went on a journey. If you want to find Christ, you have to search. You have to search through spiritual writings and also through God’s creation. You have to ask for directions; you have to enter; you have to pay Him homage; you have to give yourself as a gift and you have to be willing to return by another way.